Pet grooming is an interesting and rewarding career field for those who have fondness for animals. People who specialize in grooming or maintaining a pets appearance are called pet groomers. Pet groomers are the beauticians of the animal world. In other words, pet groomer is an individual who works with animals and enhances their hygiene and appearance using a variety of grooming techniques. Becoming a pet groomer allows you to work with animals, and provide valuable service to pet owners. Pet groomers usually groom dogs and cats, some may even groom other animals such as rabbits and horses. Like human beings pets too require caring. Well being of a pet is closely related to pet grooming. Pet groomers are in high demand as more and more pet owners look for professional care and maintenance of their pet's health and well-being. Especially in this busy & materialistic world, where people have no time for each other, they are bonding more with pets. Pets are the ones who greet you first when you come home, or who are your constant companions through thick or thin. 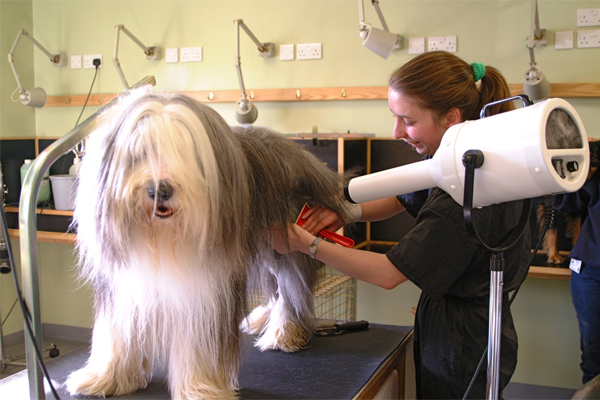 Pet grooming is not an easy task, it is a challenging field, as you never know or can be sure how the pet will behave. Some pets are extremely nervous and uncooperative during grooming procedures. So you must know how to handle them. You need to be familiar with all breeds of dogs and cats, you need to be an expert on everything from nail clipping to brushing to shampooing to trimming. Pet groomers bathe, trim, style, shape, brush and comb animals coats to make them look good and help them stay healthy. They also clip nails, clean ears, and examine animals for fleas, ticks and other health problems. Pet groomers must be proficient with a variety of combs, brushes, electric clippers and grooming shears. Pet grooming could be a lot of fun too, when pets are dressed up for pet shows and birthdays. Some affluent pet lovers even go to the extent of dressing up their pets in pretty clothes, hair bands and tiaras, to make a fashion statement. One can say, Pet groomers are half way Veterinarians. Groomers are often the first to notice a medical problem, such as an ear or skin infection, that requires veterinary care. A good pet groomer should be able to alert the owner to any possible pet health care issues. They gaurantee that your pet is healthy and safe. More and more pet lovers think it is worth finding a good pet grooming professional for the safety, health and well-being of their pets. Some feel that the safety of the animal is more important than cost. This field is also gaining popularity as pets have become a part of the social status and pet shows, especially dog shows are common now. One could consider pet grooming as a full time business or you could make it a part time business while you continue on your regular job. Anyhow this is really a rewarding field for animal lovers.